If you're gardening in containers, by virtue of circumstance or by a special interest, you know they're uniquely valuable because of the range of options available. Container gardens are beautiful, versatile, and you can have them just about anywhere! We’ve talked about building a container garden for sun; “but what about shade? !” you ask. Read on, dear container gardener. Here are your tips for building a beautiful and thriving container garden for shade with the thriller, filler, spiller method. You may recall that this is a three-part solution to demystify planting container design arrangements. 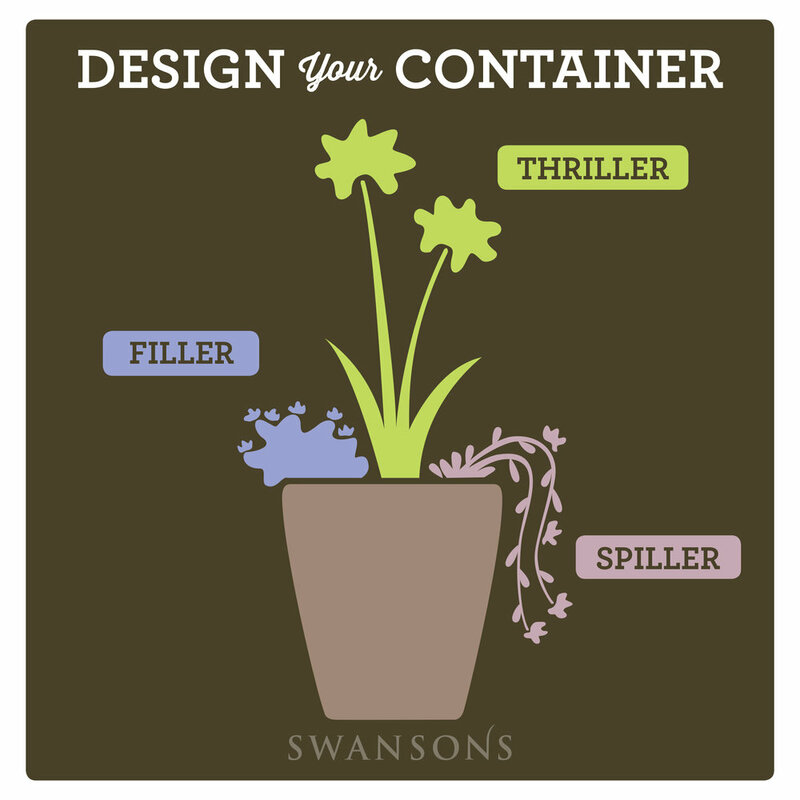 If you're new to the idea of the thriller, filler, spiller style, I can tell you that you're going to love how easy it makes arranging a container. If you need help choosing a container, this blog post can help. If you've already chosen your container, here's a handy guide on how to build the rest! The flowers and foliage that you see rise above the rest of the plants are your “thriller” plants. Thrillers have extra height and this vertical element adds a lot of drama to your container design, drawing the eye up and down through the arrangement. When deciding what to plant in your container, this is a great place to start. Hardy Fuchsia, Wallich's Wood Fern (Dryopteris wallichiana), Sword Fern (Polystichum munitum), Cordyline, Coleus, Gartenmeister Fuchsias. Moving on to the middle level: fillers! Filler plants are usually mounded plants that add the volume around the container. Nestling around the thriller, fillers are where you can easily mix in textures and colors. New Guinea Impatiens, Begonias, Coleus, Ferns, Heliotrope, Dwarf Hostas ('Blue Mouse Ears' or 'Guacamole'). 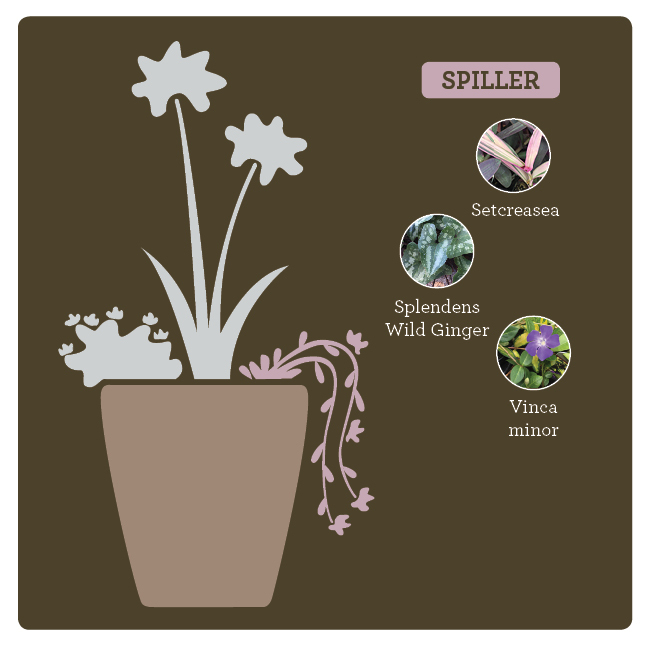 Spillers are also known as vining, trailing, cascading, and spilling plants. You get the picture. Spillers can add a fullness near fillers, but mostly they’re situated under and around the filler, gently cascading over the container. Creeping Jenny, Bacopa, Setcreasea, Trailing Coleus, Ivy, Vinca minor, Splendens Wild Ginger (or other Hardy Gingers). Voila! 1, 2, 3, and just like that you have a dynamic container arrangement! Some of the plants we suggested are seasonally available, so feel free to ask us for substitutions. Of course, if this little guide didn't offer enough clarity for you to feel ready to put your container arrangement together on your own, come in and talk to any one of our experts. We would love to help you create your container or even design and plant one for you! You can reach out over social media using #heyswansons for advice, as well. We're always happy to help you grow your garden!